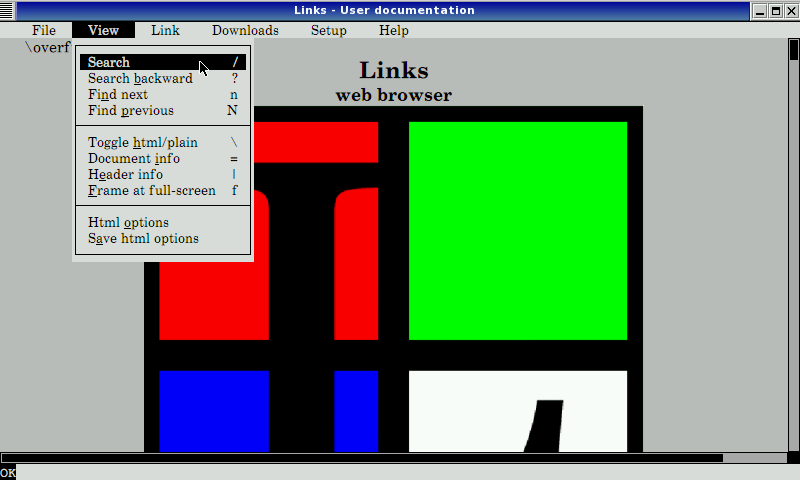 Links is a web browser running in both graphics and text mode. VERY, VERY fast. My favourite browser to use on the Pandora; it satisfies 95% of what I'll use a browser for. Update: start-script now honours command-line-parameters. Update: now it's possible to start in "scrollmode" and use the right nub for scrolling up/down and left/right. In the regular version, you can hold middle-click (down on the right nub) and scroll around the page. The scroll-mode version disables left-and-right mouse clicks, so you can't use any other program while you have it open. However, it's a bit more comfortable to use for me, so I use the scrollmode version when I don't plan to do anything except browsing. Here's how to edit your DOWNLOAD directory (mash's instructions from the forum thread): You will by default find your downloads in the "/appdata/links/"-directory on your SD-Card. But in this directory, there's also a (hidden) directory called ".links", and in that directory you will find the file "links.cfg" (maybe you first have to save the options once). In this file, there's a parameter called "download_dir". It's persistent, e.g. saving options does not alter it. Edit it to your liking. For example: download_dir "/media/YOUR_SD_CARD_NAME/path/to/your/downloads/"